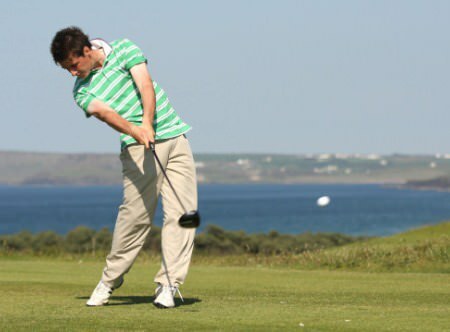 Chris Selfridge drives for Irish Close glory at Royal Portrush on Sunday. Picture by David Ross/Ulster GolfIf next month’s Irish Open is even half as dramatic, we’re in for a cracker. The records will show that Moyola Park’s Chris Selfridge led the Golfsure sponsored Irish Amateur Close from pillar to post, clinching his maiden senior title by two strokes on five-under par 283 thanks to a closing 75. But scorecards seldom tell the full story. Darren Clarke, who was practising with a belly putter on the Portrush putting green, and Graeme McDowell, who was out with his father on the neighbouring Valley Course, missed out on a treat. 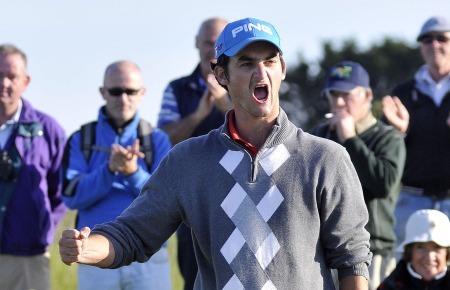 The 20-year old former Boys International was never headed at any stage following his first round 66 but in truth his final round battle for the blue riband trophy of Irish domestic golf had more ups and downs than the Atlantic swell that laps the north Antrim coastline. Chris Selfridge paid tribute to coach Johnny Foster after his win. Picture David Ross/Ulster GolfPlayed in sweltering sunshine with a fair east wind blowing around 15 mph, the championship looked over and done when Selfridge, who took a four stroke lead into the final round on eight under after a 70, then extended his advantage to six shots when he birdied the second and sixth against a lone bogey at the fifth to get to nine under. Then nerves set in, for everyone, and after a dramatic two hour battle the tall, angular University of Toledo freshman star tapped in from a foot at the last for his first win since the 2007 Ulster Youths. “I had never ever lost a lead in a tournament but I had a six shot lead at one stage and threw it away. But I clawed my way over the line. The six-foot two inch Derry man saw his lead cut to one over Whitson, his nearest challenger after 54 holes, when he double bogeyed the seventh and bogeyed the eighth to fall back to six under. And while he moved clear again with birdie fours at the ninth and 10th, he bogeyed the 12th, 15th and 16th to find himself just one ahead coming down the stretch. Whitson parred the par-five 17th to remain one behind on four under but his playing partner Hurley barged is way into a share of second with a sensational birdie. Feeling champion. Chris Selfridge. Picture by David Ross/Ulster GolfIn bushes left off the tee, the Munster man hacked out onto the bank of the Big Bertha Bunker on the right side and then hit a 300 yard three-wood over the sentinel bunkers to 15 feet - “the best three-wood of my life” - and sank the putt to join Whitson on four under. Selfridge was on the 17th in two but three putted for par, missing a three footer that would have given him a two shot lead heading down the 484-yard 18th. He needed a par to win at that stage but got a helping hand from the men in front. Reeve Whitson just misses his birdie putt on the 17th. Picture by David Ross/Ulster GolfWhitson missed the green left and bogeyed for a 73 and Hurley followed suit, three-putting from the back of the green for a 70 as they ended on three under 285. With the luxury of a bogey to win and faced with a 217 yard approach to the 18th after a good drive, Selfridge came up short of the greenside trap on the right with his three-iron. But he hit a pitch with a lob wedge that matched the colour of his shirt. Peach. It finished just 12 inches away he tapped in for a win that will surely secure his place in the Irish Senior side for August’s Home Internationals at Glasgow Gailes. Ardee’s Eugene Smith (20) claimed an impressive fourth place on level par 288 as Ballymena’s Dermot McElroy made a remarkable recovery from a third round 83, finishing with a fine 68 to share fifth place with Lucan’s increasingly impressive East of Ireland champion Richard O’Donovan on four over. Rathmore’s Walker Cup star Alan Dunbar, the pre-tournament favourite, never fully recovered from ‘flu and withdrew after a third round 80 ended his hopes of victory. Walker Cup prospect Paul Cutler showed windswept Shannon maximum respect as he opened with a three under par 69 to share the lead with Dunmurry’s Darren Crowe in the first strokeplay edition in the history of the Golfsure sponsored Irish Amateur Close Championship. The reigning West of Ireland champion holed out from 95 yards for an eagle two at the 13th and mixed four birdies with three bogeys on a day when just five players in the 156-strong field broke par on the tight but pristine parkland beauty hard by the Shannon estuary. Chris Selfridge in full flow at Royal Portrush. Picture: Pat CashmanWhile some took the “never hurry” part of Walter Hagen’s famous phrase far too literally, Moyola Park’s Chris Selfridge was faithful to the rest as he cruised to a seemingly effortless six under 66 to claim the first round lead in the Golfsure sponsored Irish Amateur Close Championship at a sun-kissed Royal Portrush. Dermot McElroy is going well in the South African Stroke Play. Pictured at Royal Portrush in last year’s Irish Close by Pat Cashman.Dermot McElroy fired an eagle and two birdies in a solid 70 to lie seven shots off the lead in the South African Stroke Play Championship in George.